Folks, the guilt is killing me so I’m coming clean; I’ve been using self-serve checkouts. Honestly, I don’t know where to hide my face. Now, I’m not trying to justify my decision (actually, I am) but we happily use, and buy, lots of things which are dropkicking Aussie workers onto the scrapheap nowadays. We can’t stop progress, even when it takes us backwards. I idly wondered how long it will be before we’re expected to do his job as well. The day probably isn’t far away when we’ll all be forced to use ECC’s. Or, if the corporations really want to save money, they could stop building megastores which need to be air-conditioned, stocked, staffed and cleaned, and just get us to queue in giant parking lots and take our chances with whatever gets tossed off the trucks. Perhaps they’ll bypass that option and simply force us to shop online? Not me though! I’ll never, ever shop online! No way! Well, not unless the queues get too long in front of the Electronic Checkout Chicks. 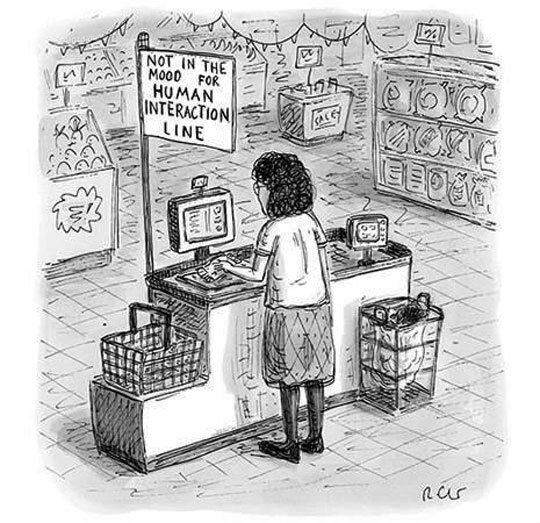 This entry was posted in On a Lighter Note... and tagged Self Serve Checkouts, Shopping. Bookmark the permalink.